I love Christmas Carolers. Real life ones, ones in the movies, ones for decorating my home for the holidays, and even paper craft ones. 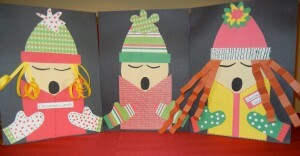 This is a fun and easy holiday paper craft. The kids can make them to look like themselves. Line them up for display and you will have an as cute as can be group of Christmas Carolers that the kids will love displaying in your home or maybe as a gift for grandma. I did a complete tutorial over at Grandmother Hen. You can check it out here. I saw that post yesterday and didn't get a chance to comment on how cute it was! I can't wait to see pictures for this years Grandkids Christmas Day Camp! Very cute indeed, and easy too. I'll try this with my grandkids for sure.